The American Roulette wheel is set up with alternating red and black spaces numbered 1 through 36. There are also two green spaces numbered 0 and 00. Bets are placed on the betting table corresponding with the numbers on the wheel, or on spaces for odd/even or red/black. You begin by selecting a chip value. Once you've selected that value, it becomes highlighted and bets on the table will be that value. Bets are placed by moving your mouse over the betting area, place your bets by clicking your left mouse button remove them by clicking the right. You cannot exceed the table maximum or be outside the defined betting range. Once you've placed your bet, you click Spin and the ball is set in motion inside the wheel. When the ball stops, losing bets are cleared and winners are paid according to the paytable. 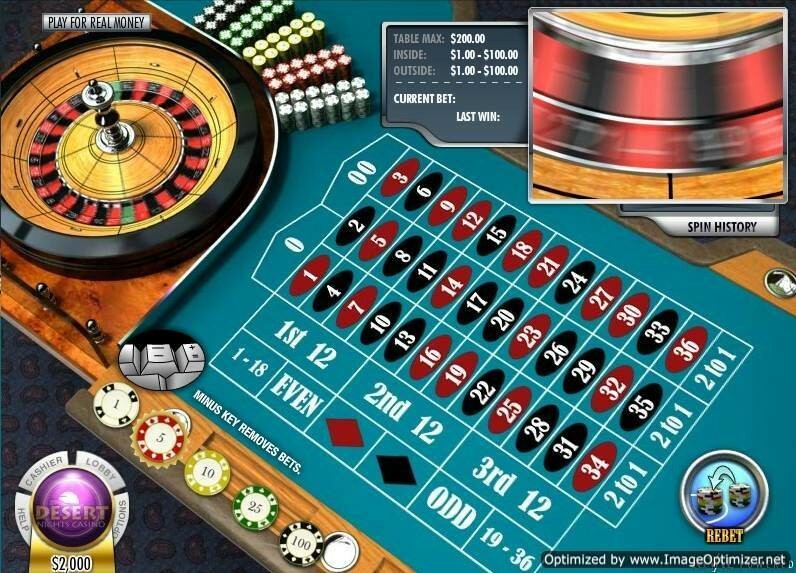 Rival's American Roulette offers magnified views of the wheel as it spins, one click chip placement, and adjustable play speed, sound, and screen size. It is available to users of both Windows and Mac.